25 Free Books if you order 100 or more! Fastest Book Printers in the World! you order 100 or more! "Truly excellent, fast service. Always a pleasure." For us, reading the reviews NEVER gets old. They show just how much our authors love us, and you'll love us, too, because we really are different! We've added reviews that have been gathered by eKomi, the Feedback Company. eKomi is an independent, 3rd party review company, so we don't control the reviews. We encourage you to read some of these reviews. Simply hover your mouse over the rating box to the right to see one customer review or, better yet, click on the rating box to see as many reviews as you'd like. They're proof that we really are completely different from any other business today. We put customer service (and your satisfaction) first! We also receive an excellent rating from the Better Business Bureau, and we have for years. So don't just take our word for it. We really do deliver as promised. You can count on it! And, of course, over 12,000 "likes" on Facebook isn't too shabby, either! Get 25 FREE books when you order 100 or more! Sure, you can order as few as 10 books through 48HrBooks, but if you order 100 or more, we'll send you 25 more books FREE. There's nothing special you have to do... we'll take care of everything automatically. We'll even list the 25 free on your order form so you don't forget. For example: simply order 100 books and you'll get 125; order 500 books and you'll get 525. That's a great deal, and it means that when you sell those 25 free books, it's all profit! Just one more way that your friends at 48HrBooks are here to help. The "2 DAY" clock starts ticking when you APPROVE YOUR ARTWORK and we have received payment in full. We count regular business days (no weekends, no holidays), and each day's cut-off is 5:00 pm EST. Any approvals after 5:00 pm EST will be counted as the following day. For example, if you OK your Perfect Bound books on Monday, we'll ship your books on Wednesday. You'll need to add SHIPPING TIME to this. 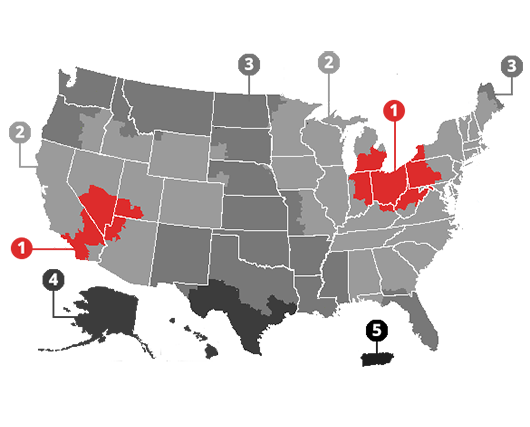 See the map above for your online self publishing shipment times. Expedited shipping (Next Day Air, 2nd Day Air) is also available. * = Please CALL US for Rush or SuperRush book printing. They are only available on a limited basis. Also, you'll need to give us enough time to get a PDF Proof back to you so that you can approve it by 3pm EST for Rushes, and by noon EST for SuperRushes. Hard cover book printing and Coil Binding take a little longer. They have a 5-day PRODUCTION TIME. And you'll still need to add SHIPPING TIME to that. For example, if you OK your hard cover or coil bound books on Monday, we'll ship your books on the following Monday. See the map above for your shipping time. Expedited shipping (Next Day Air, 2nd Day Air) is also available. 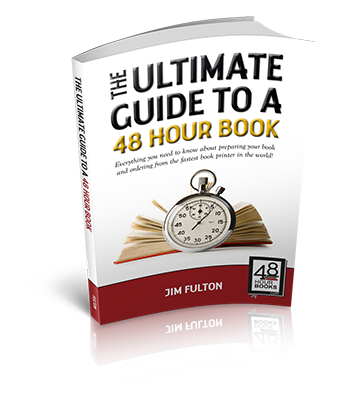 "I had an excellent experience with 48 Hour Books. The service was beyond exceptional, as those working on my project allowed me to make several last-minute changes that probably would have not been allowed at any other company. The work was completed in a very reasonable time frame, the pricing was competitive, and the finished product (Letters to Lila, by Dan Baumgart) was phenomenal. For anyone wishing to get published, I would recommend 48 Hr Books. Thank you for your professionalism, dedication to quality, timeliness, and friendly staff." "I cannot say enough wonderful things about 48 Hour Books!!! I ordered 100 hardcover books and got 25 free, which is a nice feeling. Also, my deepest thanks to April, Brittany, Kelly, and Jessica. These ladies are MARVELOUS to work with!!! I'm only good up to a point with computers. They solved my problems with their expertise. They are also great communicators. I have recommended 48 Hour Books in my book and have told my friends and associates how wonderful these ladies are. Self-publishing has been enjoyable thanks to these ladies. The books look great!!! This company is honest and their customer service is second to none!!!!! I will recommend 48 Hour books to the world!" "I just received my shipment of my book. The books are beautiful. With this being my first book to author, I feel like it is a major step forward into fulfilling God's plan in my life. Thank you for all you assistance and patience with me as we worked through my mistakes. I could not have done it without you. It's been a pleasure working with you. I will contact you again, when I have my next book ready for print. Blessings." "I am so pleased with your service! The staff was very helpful and the books look so professional. I received them first thing in the morning on the very day they said. I will be using your services again and again. For a self publisher, 48hr books is a god-send." "I just received my order of 125 total books from 48 Hr Books. The books are excellently done. In looking for a printer to do this job, I contacted local printers and considered various online companies. In my review, 48 Hr Books stood out amongst all the rest, at least in regards to their claimed reasonable price, expertise, extensive customer-help, and timeliness. I wasn't sure if they could live up to all their claims, but they did. I definitely will use 48 Hr Books for other printings of my books in the future. In a world filled with organizations that don't deliver on high claims of quality, 48 Hr Books in my experience is Quality. As an author of a book on quality management ("In Search of Quality: Principles and Mechanisms"), I..."
"The books arrived exactly on time. I haven't seen them yet, since I'm out-of-town currently. But my husband unpacked one and said it is fabulous. You have an amazing business, personalized, professional and so very accomodating. I can't believe the short turn-around timelines you are able to accomplish for such fine products. I am so very happy I learned of your company. There was nowhere else I could have printed my short-run book with the quality and timeliness you offer. Thank you forever." "Thank you for publishing my book. I am really happy with the final copy of my book. It was a pleasure working with you. I'll be more than happy to refer you to other potential customers. Staff was also really helpful. I would like to thank you, Brittany, for help and support. I am truly happy with the outcome." "From the moment I called and spoke with Jessica, she was professional, kind, helpful, understanding, efficient and empathetic. I must add that Lisa, your graphics person, was the very same way. From my heart and soul, thank you for your ABSOLUTELY WONDERFUL STAFF. Please take good, good care of them!" "I'm working on a huge marketing campaign for the book, and it is selling quite well on Amazon. I'm very impressed with the work and expediency with which your business operates, and will most assuredly use your company to publish future titles of this, and other books! Thanks again for your wonderful work!!" "I don’t know where to begin. From the ease by which I found your website when I was contemplating publishing my own book, to the final shipment of my books, 48 Hr Books was there for me. When I was confused, there was someone to walk me through the steps, when I was frustrated, there was someone to encourage me, and when I was finally finished, there was someone who acted as though I did it all myself. My books exceeded my expectations in quality, condition, and appearance. They arrived right on time and I cannot express how beautiful they are. I am truly amazed by your company." "Thank you for your excellent work in printing my book. Your courteous and considerate professional staff proved helpful at every step of the process. My inquiries and alterations were always handled with patience and politeness." "Wow! I am so impressed with not only the quality of the work but the services as well. The book was just as awesome as I had hoped and when I realized I needed the book to arrive sooner, the staff at 48 Hour Books was so helpful in helping me change my order so that I received the books on time. If you are reading this and debating who to use to print your books, let me help you out. Use 48 Hour Books!" "I received my book yesterday and they look wonderful. Very high quality work ... I was very impressed. This is the first time I created a book and had it put into book format, so I was a bit nervous. Working with this company was a wonderful experience for me ... Thank you! I want to say a special "Thank You" to Debbie and Kelly. They were both very, very helpful and patient with me and made sure I got exactly what I wanted ... they were terrific!! I would recommend 48HrBooks to anyone without reservation. If I ever write another book, you can believe that I will come to 48HrBooks. Thank you to everyone for making my book look beautiful ... you're a special group." "48 Hour Books is truly better than the rest. Not only have they made my dreams a reality, they have done so in the easiest, most painless and affordable way imaginable. Like many others, in the beginning I suspected their claims were too good to be true. I imagined that somewhere there was going to a catch, but I was quickly proven wrong. Easy, affordable and painless are only a few of the adjectives I could employ here. Professional also comes to mind, and the level of professionalism and quality when paired with the simplicity is truly unbelievable. My books are gorgeous and appear no less legitimate than any paperback you’d find at a bookstore. They even printed bar codes for my ISBN for only 20 extra dollars. Furthermore, I should add..."